Topic 11: THE RESURRECTION OF OUR LORD. Christ’s Resurrection is a fundamental truth of our faith, as St Paul tells us (cf. 1 Cor 15:13-14). Thereby God inaugurated the life of the future world and put it at the disposition of mankind. Christ was buried and descended into hell. Because Christ’s dead body continued to belong to the divine Person, it did not undergo the corruption of the tomb (cf. Catechism, 627, Acts 13:37). Christ’s soul went down into hell. “THIS ‘HELL’ WAS DIFFERENT FROM THE HELL OF THE DAMNED. IT WAS THE STATE OF ALL THOSE, RIGHTEOUS AND EVIL, WHO DIED BEFORE CHRIST” (Compendium, 125). The just lived in a state of happiness (they rested in “Abraham’s bosom”), though they still did not have the vision of God. By the phrase “went down into hell,” we understand Christ’s being present in “Abraham’s bosom” so as to open heaven’s gates to the just who had gone before him. “With his soul united to his divine Person Jesus went down to the just in hell who were awaiting their Redeemer so they could enter at last into the vision of God” (Compendium, 125). WITH HIS DESCENT INTO HELL, CHRIST DISPLAYED HIS DOMINION OVER THE DEVIL AND DEATH BY FREEING THE HOLY SOULS WHO WERE RETAINED THERE AND BRINGING THEM TO ETERNAL GLORY. THUS THE REDEMPTION, WHICH HAD TO REACH THE MEN AND WOMEN OF ALL EPOCHS, WAS APPLIED TO THOSE WHO HAD GONE BEFORE CHRIST (cf. Catechism,634). “On the third day” (of his death), Jesus was raised to a new life. His body and soul, completely transfigured with the glory of his divine Person, were reunited. His soul once again animated his body, and the glory of his soul was communicated to his entire body. Therefore, “the Resurrection of Christ was not a return to earthly life. His risen body is that which was crucified and bears the marks of his passion. However it also participates in the divine life, with the characteristics of a glorified body” (Compendium , 129). THE LORD’S RESURRECTION IS THE FOUNDATION OF OUR FAITH, SINCE IT ATTESTS BEYOND ANY DOUBT TO THE FACT THAT GOD HAS INTERVENED IN HUMAN HISTORY IN ORDER TO SAVE MANKIND. And it guarantees the truth of what the Church preaches about God, about the divinity of Christ and the salvation he brings. As St Paul says, if Christ has not been raised, then your faith is futile (1 Cor 15:17). 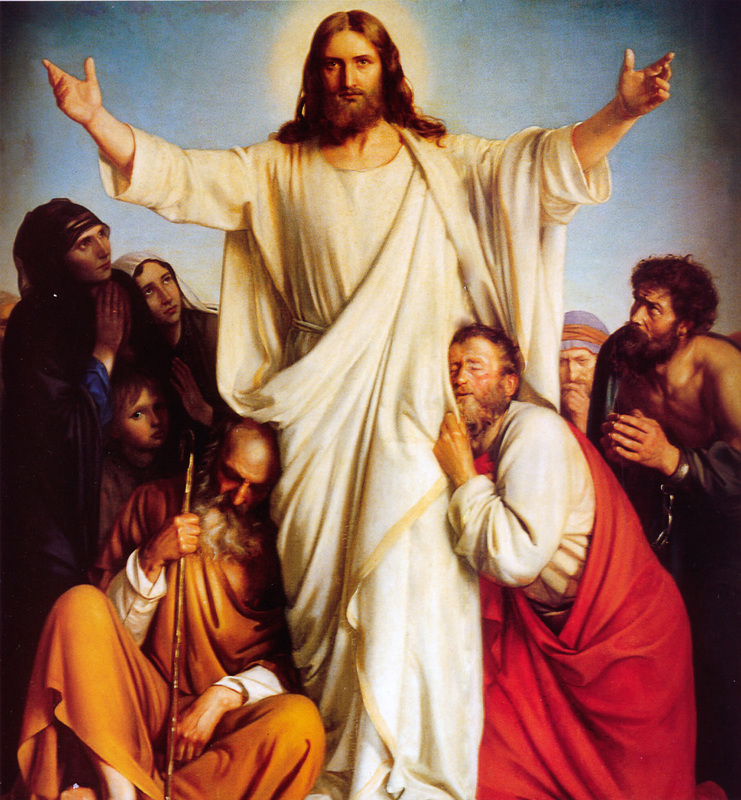 BESIDES BEING AN HISTORICAL EVENT, VERIFIED AND ATTESTED TO BY SIGNS AND TESTIMONIES, CHRIST’S RESURRECTION IS A TRANSCENDENT HAPPENING, BECAUSE “INSOFAR AS IT IS THE ENTRANCE OF CHRIST’S HUMANITY INTO THE GLORY OF GOD, (IT) TRANSCENDS AND SURPASSES HISTORY AS A MYSTERY OF FAITH” (COMPENDIUM , 128). Therefore, the risen Jesus, though still possessing a true, physical, corporal identity, is not subject to physical, earthly laws, except when he so wills: “the risen Jesus was utterly free to appear to his disciples how and where he wished and under various aspects” (Compendium , 129). CHRIST’S RESURRECTION IS A MYSTERY OF SALVATION. IT SHOWS THE GOODNESS AND LOVE OF GOD WHO REWARDS THE SELF-LOWERING OF HIS SON, AND WITH HIS OMNIPOTENCE IMBUES MANKIND WITH LIFE. The Risen Jesus possesses the fullness of divine life in his humanity so that he might communicate it to men and women. “The risen Christ, the conqueror of sin and death, is the principle of our justification and our Resurrection. The Resurrection procures for us now the grace of filial adoption, which is a real share in the life of the only begotten Son. At the end of time he will raise up our bodies” (Compendium , 131). Christ is the first-born among the dead and we too will rise again through Him and in Him. c) THE DESIRE THAT GRACE AND CHARITY MIGHT TRANSFORM US AND LEAD US TO LIVE A SUPERNATURAL LIFE, WHICH IS THE LIFE OF CHRIST—IN OTHER WORDS, TO TRULY STRIVE TO BE SAINTS (cf. Col 3:1 & ff.) And also the desire to be cleansed of our sins in the Sacrament of Penance, which enables us to rise again to supernatural life (if we have lost it through mortal sin) and begin anew:nunc coepi(Ps 76:11).